These bottles of shampoo, mask and conditioner could be the quirkiest shapes I’ve ever come across – inside them holds shampoo that promises to refine, smooth and improve the texture of the hair – and is designed for chemically treated hair. It’s actually been quite a while since mine was last properly chemically treated – I had a smattering of highlights around the front of my face in August, but since then I’ve not done much bar the usual wash/blow dry routine. But my hair does lean towards the dry side, so it is good to consider that this packs a decent punch for dehydrated hair too (chemically treated and damaged to tend to sit in the same boat in terms of hair issues (dry, brittle, lacking gloss…etc). 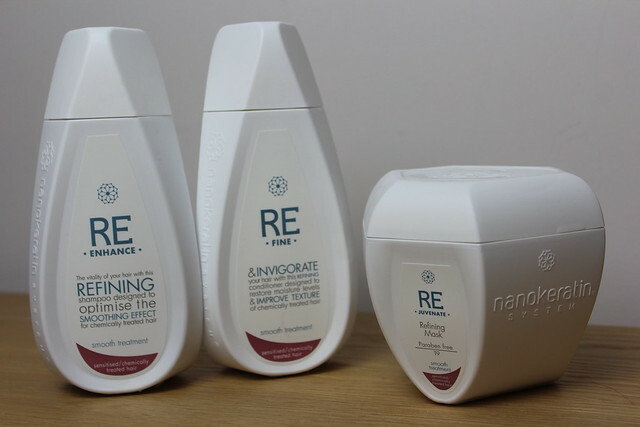 The idea of Nanokeratin is that it’s supposed to be like an at-home version of the in-salon keratin treatment – leaving dry or damaged hair smoother and softer and with lovely shine. First things first is coming back to the packaging – the bottles are shaped a bit like a tear drop (the shampoo and conditioner) the mask is a shape I have no idea how to describe and whilst these unusual shapes mean the bottle sit perfectly on the corner of the bath – my shower/bath packaging bug bear is when the lids have to be taken all the way off – this is just totally impractical for shower products. Maybe I’m just clumsy, but lids off, water etc just asks for disaster from me. Too many lovely products have been lost to slippages and drops – so my first comment has to be that I would love it if these had the sorts of lids that didn’t need to come all the way off. I would say this combo is best for anyone with dry or damaged hair but perhaps with medium or thicker hair – it’s ok if you have fine hair, but you might just want to use every other wash or to sort it and then use something else in between. But if your hair is dry then you can’t go wrong with this to sort it out in a jiffy.